Terry and Hardy Evans gave us a tour of the Wayzless. A beautiful sibling of the Wayzalot (http://www.wayzalot.com/about%202.html). They incorporated all of the best features of the Wayzalot and took it to a whole other level of style, comfort, art, and craftsmanship. You can check it out in person at the Annual Gathering of the Tin Can Tourists. Within the week of loosing the Wayzalot, in our big crash, Hardy, limping with a cast on his broken ankle, decided we needed to go look at trailer frames…..because Hardy said he wanted to rebuild!!!! In 1997, it took us two years to build the Wayzalot and I didn’t want to wait two years to travel again so we bought a 1949 Glider to travel for the next year or until the new one was built. 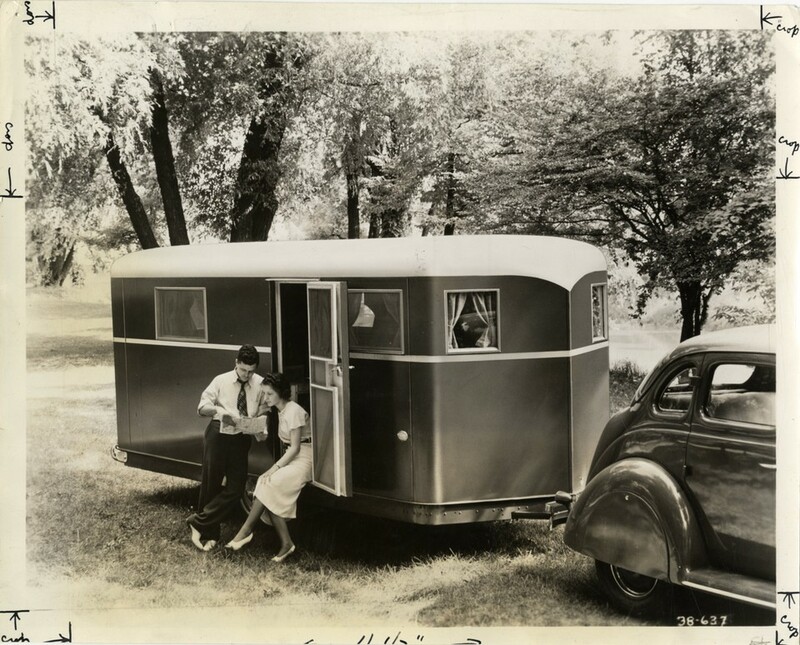 We were then not in any hurry to build a new camper and could ponder what to do with this fifth wheel frame and still participate in the Tin Can Tourist activities. We joined the Tin Canners in 2002 and have enjoyed all the activities of this club and didn’t want to miss any meets. Basically, the new Wayzless is similar to the Wayzalot. It’s a fifth wheel with a three foot back porch instead of a five foot porch, and a much smaller space inside. Hardy build a trolley top roof with a green metal roof and added a bay window in front. It is unique and will be the “Wayzless“………not a remake of the Wayzalot. It has a garage space in front and has a basement under the floor which will hold all our camping equipment and tools that we carried in the tractor. The only windows which didn’t break on the Wayzalot were the stained glass windows my sister had reinforced…so those windows are now in the new Wayzless. We also saved the back door which is already hanging. We will have the outside done this spring and the Wayzless will have its first outing at the Tin Can Tourist May Meet 2012 in Milford. We probably wont have the inside all done but it has a bed, toilet and sink so we will be on the road again in a Hardy Home, the WAYZLESS.